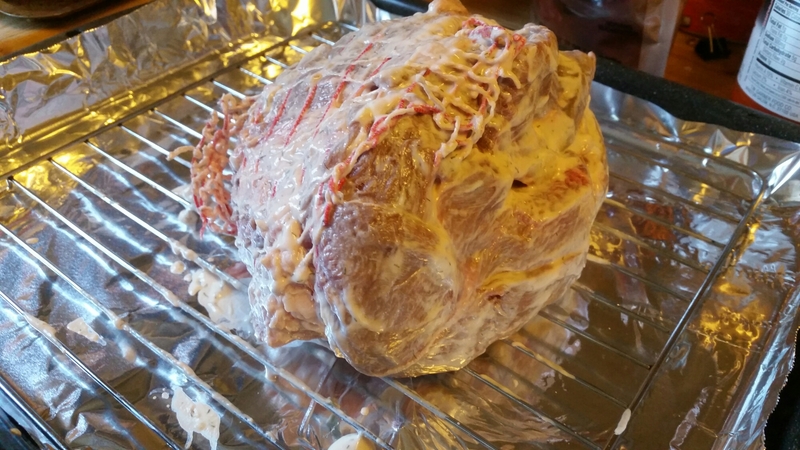 So, I picked up this gorgeous 2.2 lb boneless leg of lamb roast at Costco this morning. I also picked up a tub of tzatziki sauce/dip and marinated the lamb in it for a couple of hours. Now I’m just waiting for the oven to preheat to 450. I’ll put it in to sear for 15 minutes, then turn the heat down to 325 and continue cooking for about 25 minutes (20 minutes per pound is recommended for medium rare). Will post again when it comes out! And . . . obviously I didn’t notice that the autocorrect on my phone changed whatever I typed that was supposed to be “when” and changed it to “what” in the title. But still, this was only $3.99/pound, when there was no beef below $6.99/pound. Good thing I love lamb!